Inception, the movie that everyone seems to be talking about, is a science fiction action film written, produced, and directed by Christopher Nolan. The film, a variant on the heist genre, is inspired by the experience of lucid dreaming and dream incubation. I have avoided reading any reviews because I didn't want the plot ruined. Being a student has many advantages, I received a Student discount, and through Student Beans I was able to receive 2 for 1 cinema tickets. I'm going to enjoy being a student! 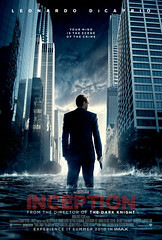 If you haven't seen Inception yet, then I recommend heading to the cinema as soon as possible. I think that it's genius and agree that this has the potential to become the next billion-dollar movie franchise. The movie centers on Dom Cobb (Leonardo DiCaprio), an "extractor", who enters the dreams of others to obtain information that is otherwise inaccessible. Cobb just wants to go home and be reunited with his children and is promised a chance to regain his old life in exchange for planting an idea in a corporate target's mind. I won't reveal anymore! With this performance, Leo DiCaprio has emerged as possibly the most influential actor in Hollywood, pursuing an acting career that he has made his own. I found his character's struggle to reach out to his children, fulfill the commitment to his wife that they would grow old together and the convincing portrayal of a haunted man to be emotional, believable and have relevance. You create the world of the dream?! Accompanied with incredible special effects, and a mesmerising score provided by Hans Zimmer. This has to be experienced on the big screen! Leo DiCaprio has come a long way from Titanic, where he broke more than the heart of his screen sweetheart. I have since learnt that Joseph Dawson, a trained carpenter, left his home city and found a berth on the ship billed the "Queen of the Seas" to be a story in some ways more fascinating than even that woven around his invented namesake, Jack Dawson. James Cameron, you ruined an introduction that would have inspired many conversations!